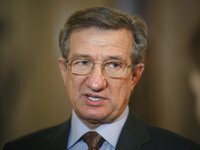 Verkhovna Rada of Ukraine deputy Serhiy Taruta is sure of the necessity to preserve the ship building potential of Mykolaiv and criticized the recommendation of Mykolaiv's mayor to tear down the building housing the state enterprise Shipyard named after 61 Communards, the Osnova Party press service has said. "It's important to create a good business climate in order for real investors to come. But without the assistance of the authorities this will not happen. City managers probably think that it's easier to tear down a shipbuilding factory than to build a trade pavilion in its place. It is easier than to look for possibilities for preserving the highly technological infrastructure," Taruta said during the party's tour in Mykolaiv. "This approach has no future. This is why the city needs a managerial approach, a strategic and an industry specific investor. I use all these possibilities in order to solve problems," he said. Osnova Party head Andriy Nikolayenko said, "Mykolaiv is a very strong region with a good technical school. It needs a serious investment stimulus. A reshuffle of municipal chiefs would help." Taruta emphasized the importance of taking measured and intelligent decisions by city authorities, especially now, because the production infrastructure of the city is being replaced by provision of port services.